Today, you can make a presentation using a tool like SlideShare and upload to cloud hosting for sharing with colleagues. This presentation sharing tool site has become one of the most preferred ones and offers you a great opportunity to promote content and get the visibility you are seeking. But first of all, why SlideShare and not any other conventional presentation tool? Well, we all are aware of the tremendous reach of social media. But platforms like Facebook, Twitter, YouTube and Instagram are being used by all and sundry. Slide Share remains one of the content marketing platforms that is still relatively underutilized. There is thus lesser competition to deal with and you can get the exposure you want rapidly. If you are looking for quick results, this presentation platform is without doubt the ideal one. How can you therefore use SlideShare to promote your business interests? Let us understand the fact that any presentation is only as useful or effective as the eyeballs it is able to attract. When you use SlideShare for your in house presentations as well as elsewhere, you get the advantage of creative colorful images and headings. That is sure to engage the attention of your audience. Pictures speak more effectively than words and you need not dwell too much time on each slide. An attractive and well designed presentation will always get more than its share of views. SlideShare content is also favored by Google and from an SEO perspective that is a great help as more and more people are likely to get access to your presentation in a shorter period of time. Your content is more likely to get found through Google search due to the higher ranking Google would accord to SlideShare presented material. 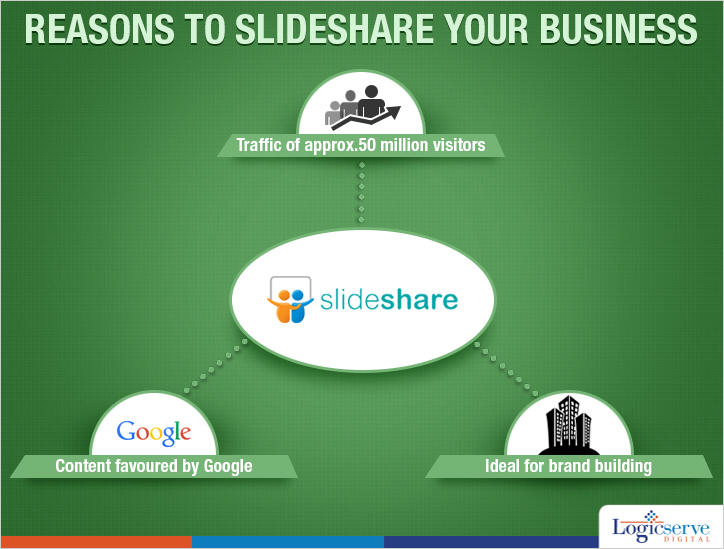 SlideShare already enjoys traffic in excess of 50 million visitors and they are unique visitors. When you expose this traffic to a well made presentation, they are more than likely to support your product or service and enable you to get the visibility you desire. SlideShare is ideal for those of you just starting out in business. It is economical and you can rank high making use of simple keywords and phrases that you will use to optimize slides. For instance, a minor tweak of using one of the main keywords as the name of your file will itself pay you rich dividends. Another trick is to use the keywords in your title as well as description. These will be crawled by the search engine spiders and your content will rank higher. Slide Share is an obvious and natural fit for attractive visual content. You can use the power of Slide Share to look at other presentations that have been developed by others in your niche and make improvements in your own presentation. You can also add the SlideShare widget to your site or blog and visitors will immediately get access to your content on SlideShare. The above reasons we trust are more than sufficient to convince you about the utility of SlideShare. Slideshare is a content marketing hub that will help you position yourself as an expert in your field. With content marketing becoming an important part of our everyday activity, using slideshare is now a must for any digital marketer. Nurturing Social Relationships – How Do You Do it?